At Moose Track Adventures, we want to be as welcoming to all of our visitors as possible. This is why we are proud to say that we are a pet friendly lake cabin. After all, what’s an outdoor adventure without our own furry friends? When you enter Moose Track Adventures, it’s likely that our own two golden retrievers will be greeting you with happy faces. Located in Ely, MN, Moose Track Adventures is the perfect place to enjoy the Boundary Waters Canoe Area, the BWCA, with the entire family. As a pet friendly lake cabin, we pride ourselves in letting our families feel like they are making memories in the comfort of their own home. 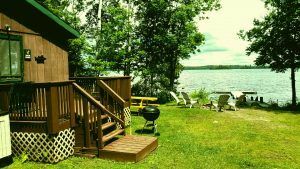 Our cabins offer multiple room options and come with everything you typically need in your own home. Now, at most pet friendly areas, there are many different requirements. One of the biggest rules we see in other areas along the BWCA is that all dogs must remain on a leash. At Moose Track Adventures, however, we know that this isn’t typically what you do at home. In the interest of all our guests feeling at home, we welcome all dogs that are well socialized with people and animals to come off or on the leash! All we ask from our guests is that they are never left unattended at any point during your stay. ● Gorgeous views of the lake right out your large picture window! So what else are you waiting on? Give Moose Track Adventures a call today, reserve your cabin for the spring, load up the dog, and head out to Ely, MN. For more information on visiting the BWCA and lodging in our pet friendly cabins, give Moose Track Adventures a call today at 218-365-4106 or send us an email at info@moosetrackadventures.com.